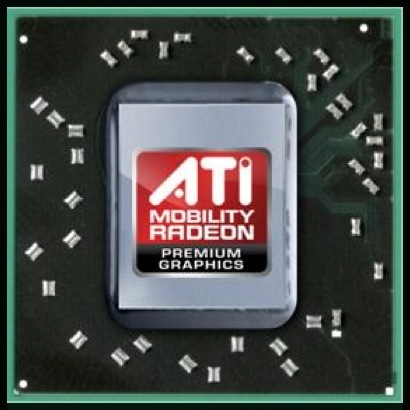 The ATI Mobility Radeon HD 5870 Crossfire (CF) (or ATI Mobility Radeon HD5870 X2) is a high-end DirectX 11 capable graphics solution for notebooks by AMD. It consists of two single Mobility HD5870 cards bound together using Crossfire (similar to Nvidia's SLI). In this setup, alternate frame rendering (AFR) is the most common rendering technique. At the time of announcement (Jan 2010), the 5870 CF paired with GDDR5 memory was the fastest laptop graphics solution available. Technically, the chip is based on the desktop Radeon HD 5770 (RV840), but with a slower clock rate. Because each card renders a different frame, the Crossfire solution may suffer from micro stuttering at the 20-30 FPS range as there are irregular delays between sequential frames. Therefore, the Crossfire HD 5870 may need higher framerates for fluent gameplay. The memory interface of the Mobility 5870 is composed of two 64 bit wide controllers leading to a 128 bit memory bus that can access up to 1024 MB of DDR3 or GDDR5 memory. If DDR3 is used by the laptop vendor, then the graphics performance will suffer noticeably. The HD5870 CF offers 2x800 MADD cores (called Stream Processors) which are grouped in 2x160 5-dimensional groups. The cores support DirectX 11 functions in hardware (Tessellation, OIT, Post-Processing, Shadows, HDR Texture Compression). Furthermore, 16 ROPs, 40 TMUs, and 40 TAUs can be found on each chip. All in all, 2x1040 Million transistors offer a theoretic computation power of up to 2x1.12 TFLOPS. According to AMD, the HD 5000 series was also improved with regards to general computing. For comparison, the HD 4000 series received no such optimizations. Therefore, the performance of ATI stream, OpenCL, and DirectCompute 11 applications should be noticably better with the Mobility 5870 Crossfire. Compared to the previous generation (in this case the Mobility Radeon HD 4870 X2), the HD5870 X2 should be about 20% faster according to AMD. This is only valid for a GDDR5 version of the HD5870 (otherwise the memory bus would be the bottle neck). The gaming performance of the CF solution should be sufficient for all current games (2009-2010) in high resolution and high detail settings with some AA enabled. Compared to a GeForce GTX 285M SLI, the 5870 CF should be faster (altough the SLI driver support by Nvidia has been known to be a bit more superior). The Mobility Radeon HD 5000 series includes an improved video processor (UVD2) to decode HD videos with the graphics card. The new version is able to decode two HD streams simultaneously (e.g., for Blu-Ray picture in picture) if the graphics card offers enough memory bandwidth (possibly only versions with GDDR5). Since Flash 10.1 Beta, the 5000 series has also been able to help accelerate Flash HD videos (like YouTube). As the desktop HD 5000 series, the Mobility HD 5870 also supports Eyefinity to connect up to 6 monitors to the graphics chip. Of course, this depends on how many monitor outputs the laptop vendor adds to the notebook and how they are wired. Most laptops will support up to three screens simultaneously (one internal and two external). Due to the high power consumption of the Mobility Radeon HD 5870 CF, it is only suited for large laptops with good (and possibly loud) cooling solutions. According to AMD, the performance per watt ratio (same power consumption, better performance) and the idle power consumption have been improved (thanks to Memory Clock Scaling and Clock Gating). Furthermore, the chip does support PowerXpress (with an AMD chipset) and Switchable Graphics (Intel) to switch between the dedicated and chipset / integrated graphics card. Compared to desktop graphics cards, the Mobility Radeon HD 5870 CF should perform somewhere between a Radeon HD 5750 and 5770 in Crossfire mode based on the shader count of the 5770 and the clock rate of 5750.